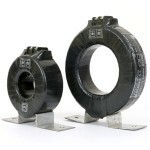 In Alternating-current Power Systems For Protection Against Excessively Large Currents Under Short-circuit Or Transient Conditions. 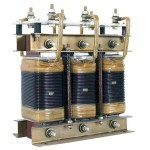 Series Reactor Are Connected In Series With The Line Or Feeder.Basically Reactors Are Used For Fault Current Reduction, Load Balancing In Parallel Ckt, Limitting Inrush Current Of Capacitor Bank In APFC Panel. Temp. Rise Restricted To Class 'B' With Harmonocs 6-10% Above Fundamental Current. Temperature Rise Not Exceeding 50-55°C Above Ambient With 10% Harmonic Currents Super Imposed. Adequate Cushion Provide To Avoid Heating Due To Leakage Flux. Timers Are Necessary Members Of Any Electrical System. Krish Engineers Provides Variety Of Timers. These Include Start Timers, Stop Timers, Cyclic Timers, Programmable Timers. 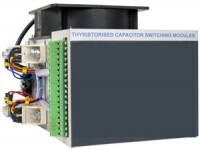 To Solve These Limitations Of Capacitor Switching By Contactors, Krish Engineers Has Come Up With Thyristor Switching Modules. These Modules Are Switched By Zero Crossing Detection Algorithm.